This course won&apos;t just teach you. It will help you apply your knowledge so you can get creative – quickly! Find out how to make a computer interact with the real-world – you&apos;ll be learning the basics of IoT without realizing it. Robots. A sound controlled Christmas tree. This course proves anything is possible with an Arduino! Seeking inspiration? This course will help you get creative with your Arduino quickly. Build a complete spy robot! An Arduino might be a tiny computer but it can be used as the foundation for a huge range of projects. In this course, we&apos;ll show you how just some of the projects that are possible with an Arduino. From robotics to secret agent gadgets, we&apos;re pretty confident that this course will get you thinking creatively – and inspire you to create your very own new projects using the Arduino hacking skills you learn. This course, combines both text and video content – it&apos;s made up of three modules to help organize your learning. In the first module we&apos;ll show you how to build three different Arduino projects. All of these will not only get you up and running with something practical, they&apos;ll also help you better understand how the Arduino works. Find out how to develop a home automation system and even build a robot! In the second module we&apos;ll go one step further to help you get creative as you learn how to program LEDs with your Arduino. You&apos;ll find out how to build a mood lamp and a remote-controlled TV backlight, before going on to make a sound controlled LED Christmas tree that makes use of sound visualization. 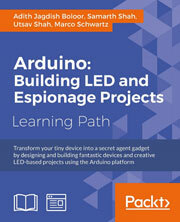 Finally, the third module takes you from stylish design into espionage, as you learn how to create neat secret agent gadgets with your Arduino. Find out how to build an alarm system, a fingerprint sensor, even open a lock with a text message. And that&apos;s not all – but to find out more you&apos;ll have to dive in! Combining both video and text and built from some of Packt&apos;s very best Arduino content, this course comprises of three modules covering a range of projects. It&apos;s completely focused on helping the user get creative as quickly as possible so they can explore what&apos;s possible with Arduino themselves.